Feathers, waves and an eagle feature on the designs of the FIFA World Cup 2018 kits. With the football tournament kicking off today, here's a look at all 32. The World Cup takes place from 14 June to 15 July 2018, in 12 stadiums located in 11 Russian cities. All 32 kits teams have released new home and away strips for the event. Highlights include a feather pattern for Nigeria, a stitch-style design for Japan and a lion-face graphic for Senegal. Adidas and Nike are behind many of the World Cup 2018 kits, but there are also a handful by other sports brands, including Puma and New Balance. The host's World Cup shirt is a revision of the jersey worn by the Soviet Union during the 1988 Seoul Olympic Games. The red and white shirt has the country's flag and the Russian eagle printed on the inside collar. The simple green and white Saudi Arabia kit pays homage to the federation's 1994 team, which reached the final 16 at the tournament held in the United States. Egypt's shirt features the colours of nation's flag – red, black and white – with a subtle chequered pattern running throughout, and Adidas' signature triple stripes running down its side. An engineered jacquard graphic is embedded in Uruguay's shirt, inspired by the nation's Sol de Atlántida monument. The design has a classic dark blue collar and Puma's logo also in dark blue. Portugal's success in the Euro 2016 football tournament is marked with "celebratory splashes of gold" on its otherwise burgundy and green kit. Spain's traditionally red and yellow kit features a diamond-shaped printed pattern running down the right-hand side, a feature last seen on the country's shirts at USA 1994. Morocco's 2018 World Cup home kit is a clean red shirt with three white stripes on the shoulders and a white collar. It will be paired with green shorts and red socks. Adidas has designed a clean and simple shirt for Iran, which includes only two colours – red and white. The brand's logo, striped shoulders and sleeve detailing are in red. Designed to put a modern spin on its tricolour flag, France's blue, white and red shirt has "Nos Differences Nous Unissent", meaning "Our Differences Unite Us", written inside the collar. Inspired by the kit worn in the teams' decisive 2006 World Cup qualifier – when the team qualified for a major tournament for the first time in 32 years – Australia's 2018 version is gold with a dark green collar, and unique graphic print on the sleeves. This slimline shirt, in Peru's classic white and red colours, is adorned with gold details on the shoulders and retains the classic sash across the front. White Hummel chevrons run down the arms of Denmark's World Cup shirt, which is otherwise – and unsurprisingly – predominantly red. In celebration of the Argentine Football Association's 125-year anniversary, the country's kit incorporates laurels underneath the AFA badge, which also has two gold stars placed above it to represent its two World Cup victories. Nature inspired Iceland's bold blue home shirt, which has speckles of red and white on the shoulders, as metaphors for ice, water, fire and geysers. The World Cup 2018 kits include a new interpretation of Croatia's eye-catching red and white chequer design, with the squares increased in size compared to previous years. 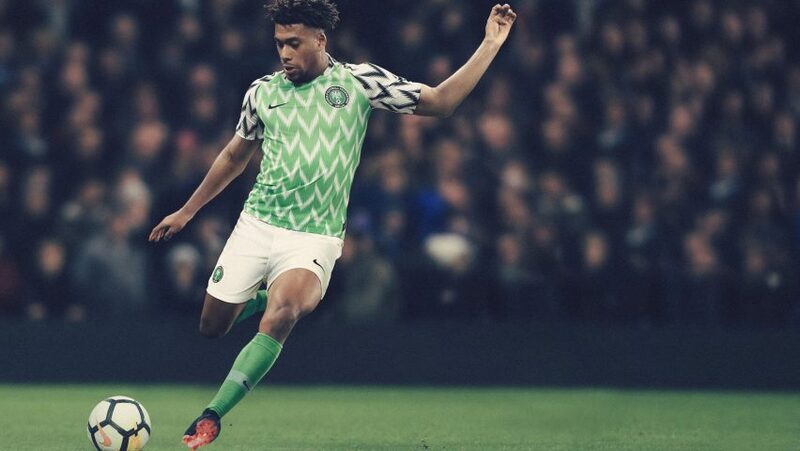 Nigeria's top has feather-style patterns – black and white for the sleeves, and green and white for the torso – based on the shirt the team wore when they qualified for the competition for the first time in 1994. Brazil's yellow shirt is the same samba gold shade as the kits worn by the team that won the tournament back in 1970 – the first year the games were broadcast in colour. The nation's flag, the Puma logo and a unique red design demonstrating the topography of Switzerland's mountain-dominated landscape, pop from this predominantly white shirt. Costa Rica's traditionally red and white kit was released under the slogan "Declare your DNA", and features subtle DNA stripes across the front left of the shirt, over the heart. A very low-key and understated look, the Serbia 2018 World Cup shirt by Puma, is red with a white crew neck and has a white stripe on each sleeve. Inspired by their third World Cup win in 1990, Germany's 2018 shirt features an updated monochrome version of the old printed graphic, and a gold World Cup winner's badge to celebrate their victory at the last tournament in 2014. Harking back to the eye-catching, all-over print used on its World Cup 1994 shirt, Mexico's 2018 version has a green graphic pattern running from the curved red hem up towards the armpit. Seeking inspiration from the classic Sweden jersey worn in the late 1980s and early 1990s, Adidas' design for the country's shirt this year is bright yellow and blue with subtle diagonal stripes. Inspired by the Korean flag, the contemporary 2018 shirt is adorned with a custom Tae Geuk wave pattern that represents the global influence of South Korea. Featuring a woven team badge located in the centre, Belgium's World Cup 2018 top is a refreshed take on the black, yellow and red argyle print the team played in at Euro 1984. The front of Panama's red and white shirt has a subtle chevron design pattern inspired by Panama City's skyline and the national bird – the Harpy Eagle. Tunisia's plain white World Cup shirt has red hems, with the brand's motif and the logo of the Tunisian FA in the same colour. This slimline shirt features the Saint George's cross on the neck, a rosette located on the inside of the collar, and red, white and blue colours, as historically seen on England kits. A light grey eagle from the country's coat of arms straddles a graphic sash on Poland's shirt, which also has a subtle zig-zag pattern on both sleeves. The team's nickname "Lions of Teranga" inspired Senegal's World Cup 2018 kit, which has a lion's face graphic on the front, green striped sleeves and green collar. Colombia's striking yellow home kit is inspired by their iconic World Cup 1990 apparel, and features spiky blue and red graphics matching the colours of the South American country's flag. In homage to Japan's traditional handcrafted clothing, its team's blue shirt features a minimal white all-over print on the front, imitating the appearance of a stitching technique known as Sashiko.